The Golden Princess pulled in to Juneau, Alaska mid-morning. 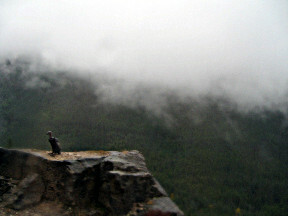 Skies were a little grey, clouds were hanging low but it was a pleasant day. The mountains rise steeply from the ocean. 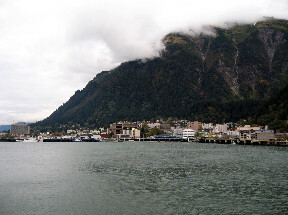 Juneau is the 2nd largest city in the world in area, it’s just that most of it is straight up and down. 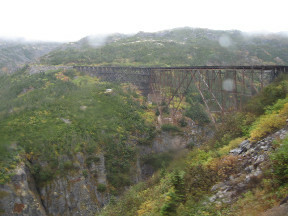 Skagway was our second stop. These granite cliffs have been signed by ships crew, much like the signature cliffs in Wyoming, and the settlers on the Oregon Trail. Partly cloudy day, very pleasant weather, a few sprinkles but very refreshing. Ahhh, clean air! 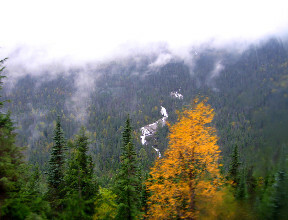 The leaves were just starting to change and the clouds were just starting to clear on this train ride on the White Mountain and Yukon Railroad. 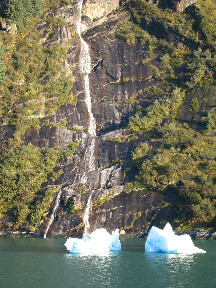 The water fall across the canyon is the Bridal Veil Falls. 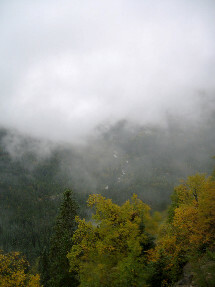 The train is headed for White Mountain Pass. 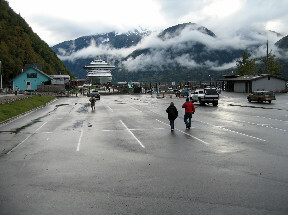 Because the Pass is in British Columbia we were not allowed to disembark. The engines changed track and moved from the front of the train to the rear, passengers flipped over their seats and changed sides for the trip back down the mountain. I don’t know what this is! 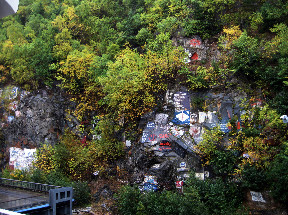 The train was moving along at a pretty good clip and we went right by this site and I was quick enough to press the button to take the picture. I don’t think Alaska has buzzards. The mountains rise at such a steep grade that all the views were spectacular. The lichen on the rocks and changing leaves on the trees brought out incredible colors. This tressle is no longer used but is perfect for picture taking. Train ride is over and we head back to the ship. Of course, we had to stop in all the shops in Skagway, getting our first look at the native art and crafts. I also discovered this is where Soapie Smith is buried. I knew he was a bad boy in Colorado History and when he left Denver he went to Skagway, and died in a shootout and is buried just outside the cemetery, not with the ‘decent folks’. Blue ice bergs! 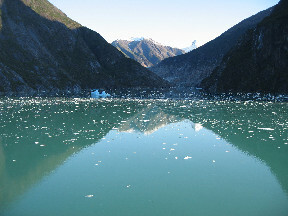 We entered the Tracy Arm Fjord with the sun shining and the sky a beautiful blue. The ship’s captain said the weather we had been experiencing was the best in six months, and today was picture book perfect. 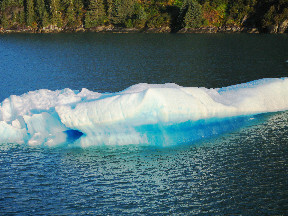 The density of the ice is why the ice berg appears blue. Waterfalls are everywhere. When the water and ice flows over the granite it ‘powderizes’ the granite and turns the water in the Fjord a shade of green with the silt. Because of the perfect weather the Golden Princess was able to go all the way up the Fjord. This view shows the water completely still and the mirror image of the peaks covered in the fresh snow. Lots of broken up ice bergs are floating in the water. The ship is able to turn around in the space of it’s own length. Many times, because of the mountains rising right out of the ocean, it appeared we were going to sail right into the side of the mountain. The Fjord had several ‘S’ turns that the ship navigated perfectly. 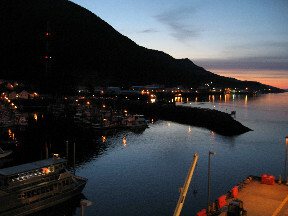 We pulled up to the dock in Ketchikan at daybreak. Another great morning of walking and shopping, particularly at the chocolate shop. They had the best fudge and cherry cordials! Another beautiful sunny day. Our next stop would be Victoria, BC, then back to Seattle. This entry was posted in Travel and tagged Alaska, Alaska cruise, Golden Princess, icebergs, Juneau Alaska, Ketchikan Alaska, Photography, Skagway Alaska, Soapy Smith, Tracy Arm Fjord Alaska, Travel, vacation, White Mountain and Yukon Railroad, White Mountain Pass.